She operates her business, Perennially Yours, from her home in Ballston Spa (between Saratoga Springs and Albany). 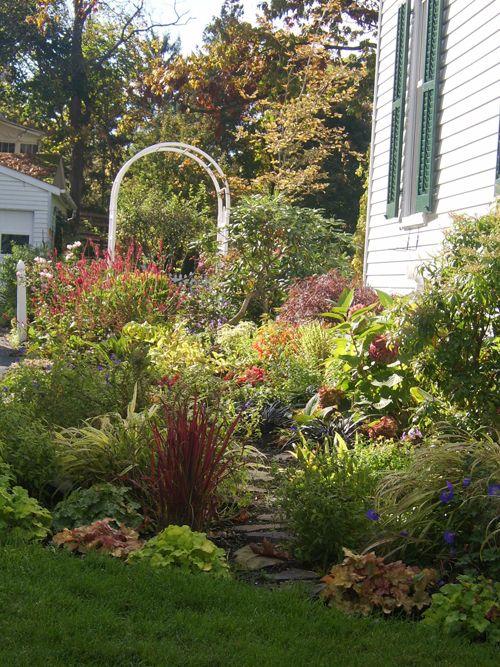 Beautiful display gardens surround her quaint 100-year old village property. 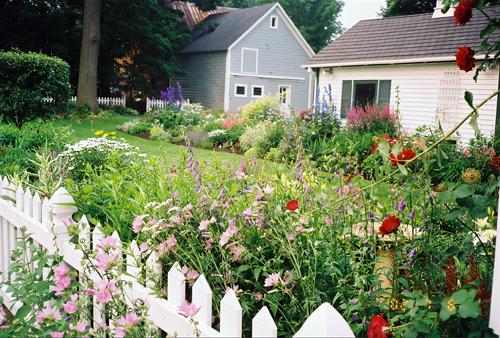 Mendez consults with homeowners and some commercial property owners on how to create and tend gardens that are colorful, are organic and require less maintenance. She also gives talks, teaches classes on gardening and landscaping and writes a column for Life@home, published by Hearst. She loves helping people become satisfied gardeners, so when you go to the opening day events, make sure you bring along questions about your own garden. I told Mendez that I want a garden that looks like the ones in her photos. In my garden, I wanted a full, lush mound of black-eyed Susans next to a large hosta with a grouping of lily of the valley nearby. Instead, I ended up with a weedy-looking mess because none of them stayed where I put them. Mendez offered wonderful advice to help me out of my predicament. For perennials that spread by root, she suggests putting the plant in a pot, and setting the whole pot in the ground to contain it. That’s something I realized I had to do with my lily of the valley this spring. For plants such as black-eyed Susans that are heavy seeders, don’t let them go to seed, Mendez suggested. Aaah! I had been leaving the seeds in place both to feed the birds and to add interest during the winter. I think this year I will leave just a few seed heads in place. Another tactic to prevent the spread of plants by seed is to use corn gluten to kill the pre-emergent plants, Mendez said, but be careful. Corn gluten will also kill biennials such as foxglove and hollyhocks; it can’t tell the difference between seeds you want to grow and seeds you don’t want to grow. Mendez also noted that every three or four years, you must divide your plants to reclaim space and to get every plant back into its own spot. Plus, moving the plant will shock it, so it will throw out new roots and you’ll get better flowering. This is all helpful advice. Then Mendez made a stunning statement. The compost pile? Wait, I feel dizzy. I think Mendez figured out the real reason my garden tends to look messy. While I can give my extra plants away, it’s very difficult for me to just throw a healthy plant away. That means that in order to get my garden in order, I have to carefully dig up the extra plants, find extra soil, place the plants in pots, label the pots, then give them away. That’s a lot of work. Apparently I’m not the only one who feels this way about plants. Mendez said she has worked with people who felt so bad about getting rid of plants that she told them to turn their backs while she dug the plant out for them. Mendez goes so far as to say that if you decide a certain plant isn’t working for you, you don’t have to keep it at all. Here are a couple more tips to help you along until you can talk to Mendez in person. A lot of people mis-assess the light in their garden, Mendez said. If you place a plant in the wrong spot, you may find that it doesn’t bloom well and is insect prone. Track the light in your garden in May, June and July, she suggested. A full-sun plant needs six hours or more of light between 10 a.m. to 6 p.m. Even if you get a lot of light at 8 a.m., don’t count that because it’s less intense light. You need the hot afternoon sun for a full-sun plant. Pre-registration is required for this event in order to calculate seating arrangements and food. Registration is available online. The price for the entire program including “Walk & Talk,” keynote presentation and reception is $28. The price for the reception only is $10. 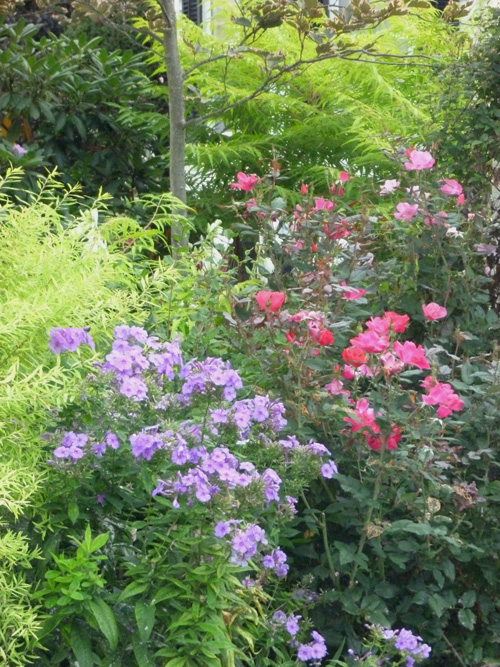 Join Mendez and Sally Cunningham, director of the National Garden Festival in Buffalo, for an informative tour of the perennials and shrubs of the Buffalo and Erie County Botanical Gardens. They will walk and talk with you and as they show you the garden’s selection of superior cultivars of great plants for Western New York. Take this opportunity to ask questions about your own garden. Learn to create and care for great looking, ever-blooming gardens using organic practices. Recommendations include plant selection, design tips, mulch, fertilizer, maintenance shortcuts and more. (An opportunity for book signing and sales follows the talk.) .For registration information and fees, see below. Come for food and drinks and meet the gardeners, speakers, organizers, and directors of this great Western New York event. You’ll have the opportunity to register early (with price breaks) for limited-seating bus tours and seminars. You’ll also be able to purchase the event’s signature “Great Green Umbrella,” a tee shirt or terra cotta plant pot coffee mug. Door prizes will be given out throughout the evening.